Home remodeling services come in all shapes and sizes, making it challenging for property owners to narrow down their choices in order to find the right contractor for the job. If you’re planning on remodeling your Georgia home, then you’ll notice that dozens of specialists are available, with each promising their own version of the best price or highest quality. It’s important to find the right home renovation company for the job, and that task often starts during the consultation process. Detail Design & Remodeling is here to deliver the best results for every budget, and we strive to complete every service with honesty, accuracy, and professionalism. Today, we’ll discuss the value of our free in-home consultation, as well as the accuracy and peace of mind that our comprehensive estimate can provide. If you’re ready to get started, then be sure to contact our cabinet refacing pros in Atlanta today to get started! While most home remodeling contractors offer a “free estimate” that consists of an over-the-phone interview, Detail Design & Remodeling will take the time to visit your home for complete consultation services. We believe in openness and honesty in all of our work, and coming directly to you to discuss your project goals and needs is the first step toward success. Our home remodeling contractors revel in turning home improvement visions into reality, and will take the time to get to know you and learn about your home. 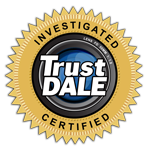 We rely on this first-hand approach to ensure there are no oversights or miscommunications in the early stages, and strive to provide the best services that we can. Instead of visualizing what a certain wood type or finish option would look like in your Georgia home, you can view the entire showroom right in the comfort of your own dining room. Detail Design & Remodeling will arrive at your home with our full inventory of design options to ensure you have every style at your disposal. Our inclusion of finish options and hardware choices can help you visualize exactly how your kitchen remodel will look inside your home. As always, our home remodeling contractors will be able to discuss with you your planned paint colors, countertop styles, and more to find the absolute best combination. 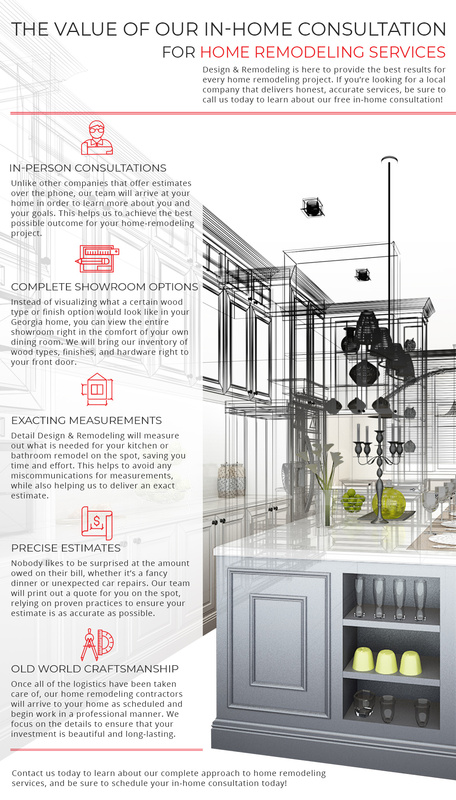 One of the most challenging aspects of acquiring an estimate for your home remodel is capturing the correct measurements for your planned work. Even if you’re sure you measured all of the appropriate planes correctly, there is always that chance that something was missed! Detail Design & Remodeling will measure out what is needed for your kitchen or bathroom remodel on the spot, saving you time and effort. With decades of experience under our belts, our team is confident that we can compile all of the measurements needed for an accurate estimate. Nobody likes to be surprised at the amount owed on their bill, whether it’s a fancy dinner or unexpected car repairs. The same is true of home remodeling projects! Our consultation is comprehensive in nature to determine the right price to expect for your plans, including any factors you were not expecting. Detail Design & Remodeling will print out a quote for you on the spot for your records. When you’re ready to begin work, our remodeling company will plan a start date to begin transforming your space. Once all of the logistics have been taken care of, our home remodeling contractors will arrive to your home as scheduled and begin work in a professional manner. Detail Design & Remodeling takes great pride in our Old World craftsmanship, relying on timeless techniques that deliver an amazing outcome. The value of our services is in the detail, and our remodelers will take every step possible to ensure that you are satisfied with the results. Our team specializes in cabinet refacing for Atlanta homes and beyond, and we will work with you every step of the way to create a cost-effective outcome that provides the most value for your daily convenience. We offer total home remodeling services, as well as custom woodwork to deliver a complete result that will impress your guests for years to come. If you’re ready to get started, then be sure to call us at 770-515-9499 or contact us online to get started. We look forward to working with you!